Simply put, the Alcatel 1C 2019 is a low-cost smartphone that runs on the Go Edition of the Android 8.1 Oreo operating system, which is essentially a lighter version of the stock OS that comes with a bunch of built-in optimizations to complement entry-level mix of pros and cons, such as stripped-down versions of essential Google applications designed to eat up less phone memory and consume less data allocation. Explore the Android Go category here. Its specs are powered by a sub-standard (as of this Phonerated review) Spreadtrum SC7731E quad-core processor clocking in at 1.3GHz and a measly 1GB-only RAM . 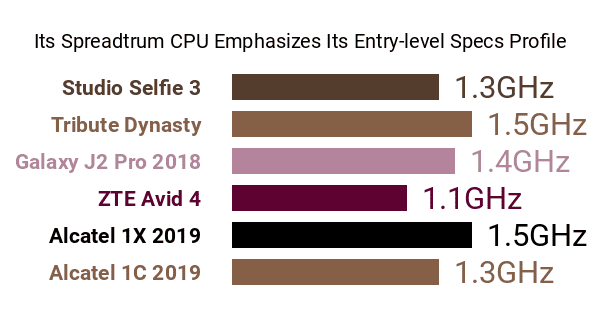 In comparison, the 1X 2019, with which it entered the low-budget market, runs on a higher-tier 1.5GHz MediaTek quad-core chip. A couple more of the 1C 2019's cons include its old-fashioned 8GB native storage memory and its support for no more than 32GB of memory expansion -- some of its entry-level prepaid rivals support 128GB microSD cards. Its lack of a fingerprint reader , which was all but a standard smartphone facet as we were checking it out, is a big drawback as well. Also sitting under the hood is a 2000mAh-only battery promising a dismal 15-hour standby time (28 hours on 3G), not even reaching a full day on that particular attribute. 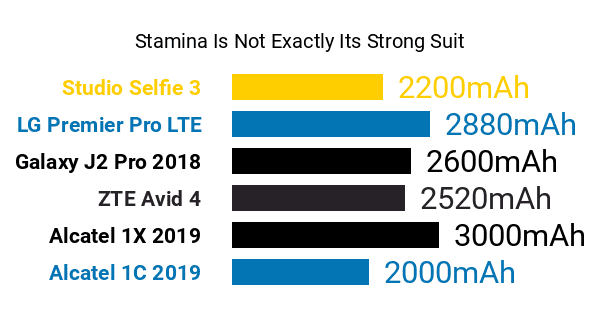 That being said, the absence of 4G LTE network compatibility somewhat justifies its mediocre battery pack, since 4G phones tend to drain battery life way faster than 3G-only ones. The 1C 2019 is equipped with a 5-megapixel rear-facing main camera interpolated or software-enhanced to mimic an 8-megapixel cam, while a 2-megapixel selfie cam that's also interpolated (to 5 megapixels) sits up front. 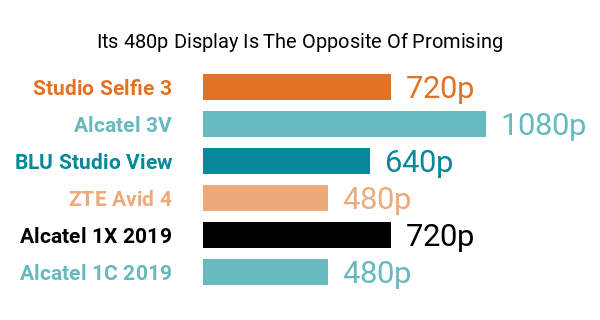 As for its display, this early 2019 Alcatel release offers a 5-inch 960 x 480 (FWVGA screen whose 18:9 screen aspect ratio at least sets it apart from most older entry-level smartphones -- those that come with 16:9 screens only. Its 2.5D Dragontrail Glass screen finish is a nice pro as well, especially since it matches its micro-textured backing fittingly. At the end of the day, however, this cheap dual-SIM model's pros and cons only makes it good enough as an introductory smartphone or one for budget-wary shoppers.